The Survey Results Are In! How Do You Compare? I’ve spent the last few hours going through every single response from our recent community survey and it has just blown my mind. This blog is no longer about happiness… this is a big one for me. Although I still link everything back to happiness as it is the ultimate state in which you can be, there is so much more to what this community is about. I think it’s fantastic! There are topics such as business, finance and performance psychology which are key priority areas for you so I’ll definitely be spending more time on this. The results even give rise to the fact that the name of our community ‘The Start of Happiness’ may not actually be that appropriate moving forward… What do you think? I used Survey Monkey to collect responses to the survey. Unfortunately I didn’t realise that the free version of the software only allows up to 100 responses! We had over 100 responses, we had 120 (although I was actually expecting higher… maybe I’m too optimistic? 🙂 ). But that was easily fixed with a simple subscription. The survey had 10 questions, the first 5 being quantitative and the last 5 being qualitative. Now, last year when we ran the survey we only had quantitative questions. This makes it super-easy to pull graphs and quickly get a snapshot of our thinking, however I wanted to delve a little deeper this year so included some qualitative. This was hard work pulling the key themes from all the various answers, however there definitely were key themes that shone through. I categorised each response and then looked at the overall number of responses in each category to see which the most dominant themes were. So, enough up front talk, let’s get into the results! Question 1: On a scale of 1-10, how happy are you? Overall, I was actually very pleased to see that the bulk of our community is in a pretty good place! The highest responses were clearly at 7 and 8. A question like this is highly influenced by your state when doing the survey. So, if you just had an argument with your partner, you would have probably rated lower. If you just had a great lunch with friends, you would have probably rated higher. In saying that, through the volume of answers you get a pretty good feel for how we are all feeling and thinking. This year we tend to be a LOT happier than we were last year! Last year, our most dominant rating was a ‘5’ and we had a large number of ‘3s’. Question 2: Thinking about your primary occupation, are you currently doing work you love? A key principle of The Start of Happiness is to help you find and do work you love. I was again actually quite impressed with the responses from this question, with 52% of people saying they DO do work they love. Generally speaking, various research and studies show that normally about 80% of people are currently in a job or career they dislike. So, we’re well ahead of the game! I didn’t ask a similar question last year so we have no benchmark for this one, but it’s definitely something we can track. Question 3: On a scale of 1-10, how important is it for you to have a clear understanding of what you want to do in life? 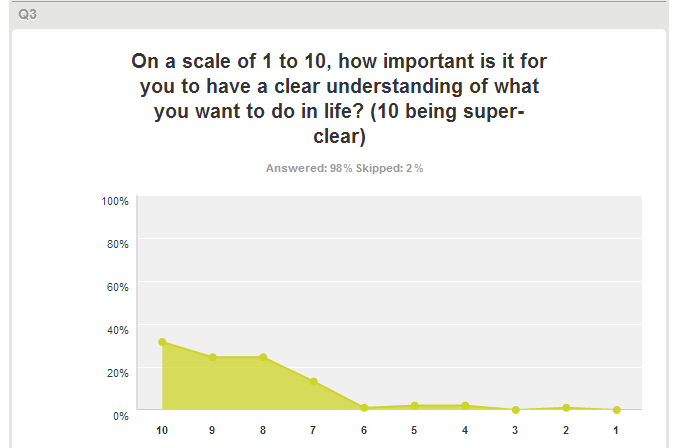 Nearly everyone believes it’s very important to know what you want to do in life with 94% of responses being from 7-10. How does this compare with last year? The results are very similar to last year. It’s great to solidify our understanding that it is every human’s desire to know what we want to do in life and have some direction and purpose (when I say every human I mean 94% of humans 🙂 ). 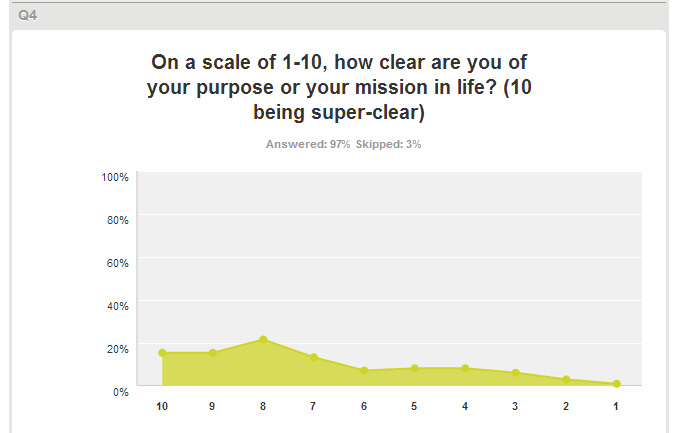 Question 4: On a scale of 1-10, how clear are you of your purpose or your mission in life? Although 94% of people responded with a 7 or above for the need to have clarity in life, the responses to this question as to whether they HAVE that clarity is a lot more spread out. It is quite clear that there are a lot of you looking to have more certainty and direction towards where we want to go. 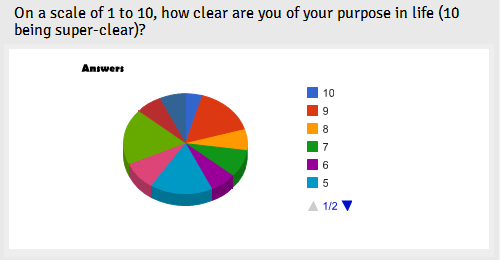 In saying that, we still do have a very large portion of you scoring 7-10 for having clarity of your purpose in life. I actually think this is AMAZING! 50% of you responded with a rating between 8 and 10! Wow… wow… wow…! This one just blew my mind. I LOVE it. That is SO good to see and it gets my excited. However, when we compare it against the next question things start to turn south. But before we get there, let’s look at last year’s results. Again, we have come a LONG way since last year. We had about 26% of you respond with an 8-10 last year, this year that amount is DOUBLED. Perhaps all my work on The Start of Happiness is paying off? 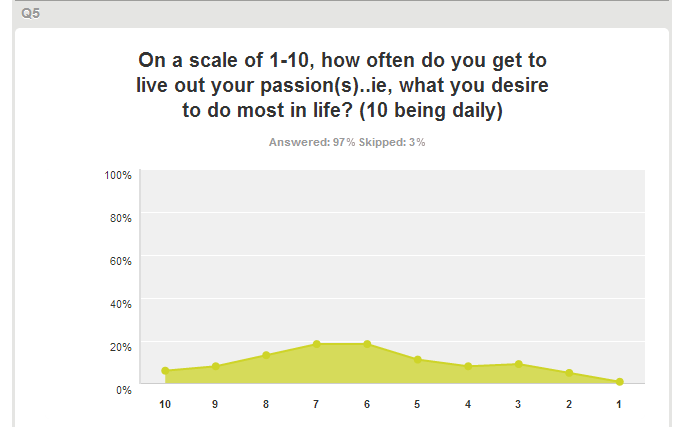 Question 5: On a scale of 1-10, how often do you get to live out your passion(s)? This is where things start to look a little interesting and where I start to ask some questions in my mind. It makes me ask the question, how can you be doing work you love but then not rate this question equally as high? I don’t have the answer… you do! So I’d love to hear your comments at the end of this post. Not one person rated themselves with a 10 last year and about 60% of you responded with a 5 or below. Again, we have significantly improved this year. What changes have you made in your life that has allowed you to live your passions more regularly? Q6: What Frustrates You Most About Your Life? There were a number of other individual responses, however the above 6 categories form the majority of the responses. The number one frustration among our community is not doing what you want. When we link this with the question above about living out your passions daily, I’m a little surprised as it was scored reasonably well. 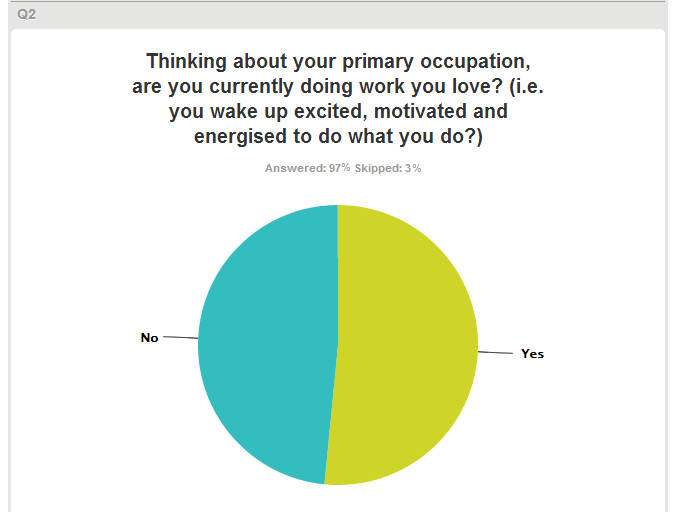 Similarly, when I see that 52% of you are doing work you love and waking up energised and excited to do what you do, I get confused by this as being a key frustration. Perhaps the way that you answered question 2 on doing work you love is different to how I would interpret it. Nevertheless, it is very clear that there is more that can be done in living out your passions daily and doing what you want to do. Relationships were next on the list with a number of people going through hard times, particularly with their partners not being on the same page as them. This was followed by psychology, where I classified areas such as fear, procrastination and motivation as key frustrations. Question 7: What are you trying to accomplish within the next 12 months? OVERWHELMINGLY, starting or growing your business was the number one goal or thing that most people want to achieve. And when I say overwhelmingly, I mean about half of the responses which is HUGE. I think it’s absolutely fantastic to know that we are a community of entrepreneurs! This is actually not what I would have expected and it gets me really excited… I’d love to talk more on this topic and now, understanding your goals, this is exactly what I’ll be doing. Finance was the second most common goal for 2014. There seems to be a number of people in debt and getting your finances in order was a key priority. Health makes an appearance as a key goal for our community, with a number of people looking for weight-loss or to generally improve their health. These were closely followed by improving relationships and doing more of what you love. Interestingly, there are quite a number of you who are looking at writing a book! That is fantastic to see. I encourage you to to actually schedule it in and make it a reality. When it’s not scheduled it will take forever. When it’s scheduled, you’ll have it complete before you know it. Question 8: What do you think you will need to double your success (or happiness) within the next 12 months? The number one thing that most people need to double their success (or happiness) is focus. There were a lot of comments on being focused and staying focused, being disciplined and sticking to goals. This can be linked back to question 4 where we saw some spread in responses on how clear people are of their direction in life. Not only that, but there is a link to the next 2 highest needs in order to achieve success: motivation and passion. Motivation and passion were closely linked in this question. When it came to passion, there were a number of responses making mention that you need a better job or to be able to do something that you are more passionate about. I believe the majority of these responses would have been from the 48% who don’t love their current work. Next on the list was support. It is clear that a number of you need more support to achieve your goals and that was either through your direct partner, your family and friends or from spending more time with like-minded people or going to networking events. The responses were quite varied by the overall theme was the need for support. Finance again makes an appearance, although much lower down the list this time. When it comes to achieving what you want to achieve, it seems finance is not as a high as priority as your own internal mindset (focus, motivation, passion) which can also be enhanced by support. Question 9: What strategies have you already tried to improve your life that worked and that didn’t work? The answers to this question were a lot more evenly spread out, however it was education that topped the list in the items that worked to improve your life. There were a number of different methods for getting educated that worked for people, including reading books, taking courses, joining a community (like this one! ), coaching, webinars and undertaking study. Exercise came out as the second strongest theme for improving your life. Interestingly, changing jobs was at number 3. As simple as that, changing jobs can change your life dramatically and your answers to this question have proven this to me. In fact, to add to this, a few people mentioned that staying in the job was something that didn’t work. I think this response was great. It goes to show it’s not about the ‘quick fix’ but it’s about the discipline and commitment to making it happen over time. Question 10: What is the ONE thing that you really want help with right now to improve your life? The number one thing that most of you want help with right now is your psychology. What I mean by this is the ability to be motivated, be disciplined and be focused to stay on track. 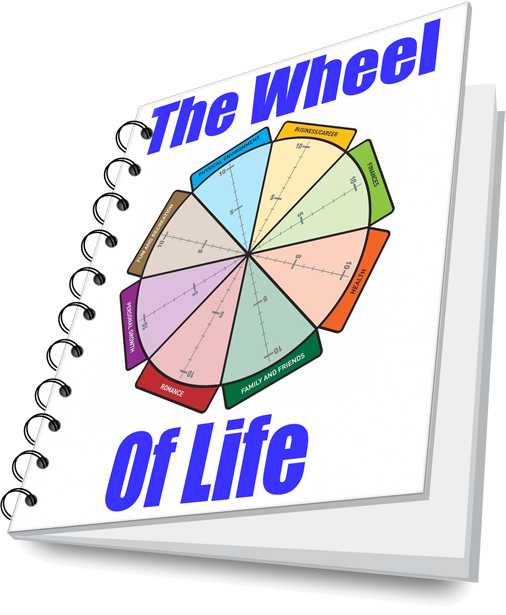 Linked to this in spots 3 and 4 were finding and doing more of living your passions and purpose in life and also building or enhancing your self-esteem and confidence. I believe these are all interlinked. The more you can live your passion and purpose, the more motivated, disciplined and focused you will be, and the more successes you will see which will raise your self-esteem and confidence. The second most important thing that people want help with right now is finances. I love this topic as I’m currently reading a lot about how your values influence your financial outcomes in life and I’d be happy to share some of my research with you. Finance is actually linked back to psychology much more than you would think. Next on the list was career and getting help to change jobs, find a job or quit a job, following by improving the quality of relationships and improving your overall health and wellness. Firstly, I just want to say a HUGE thank you to everyone who participated in this survey. I think it’s important to always take a few minutes out to reflect on your life and determining where you need to focus your time and energy. With the qualitative answers, there were just SO many responses that I couldn’t capture them all into themes. There are some amazing things that people want to achieve and there are some unique challenges that people are facing, however on the whole, this post has provided a good overview of who we are as a community. To me, there are some clear things I can focus on to better support you in reaching your goals, such as providing more insights on performance psychology (goals, focus, motivation, discipline), providing more insights into business and finances (perhaps sharing more about my own business structure), providing more insights into living out your passions and more on time management. This is great as it’s actually where I have a vision for this business to go. It’s more about helping you to start earning an income from doing what you love. To a lesser extent, there is room for more discussion on relationships and health and wellness. It actually gets me asking the question whether the name “The Start of Happiness” is at all relevant to what you want to achieve in your life. Obviously, happiness is the ultimate goal, but perhaps we can get more specific to your real needs that lead to happiness. This is actually aligned to where we are heading with the site so it’s exciting to see. But for now, I’d LOVE to hear your thoughts! P.S. I’m going to wrap all these insights up into something to help you which I know you’re going to love! Stay tuned! P.P.S. Do you think someone else might be interested in these results? Please share using one of the buttons below! that’s an interesting survey you did! It’s really useful to see what people struggle with and how far they’ve come in their journey. One because it gives motivation to see that you’re not alone in the world. And two because it can be used as a guideline to create content people REALLY want to read. It’s not like the average newsletter asking for “What type of content do you want from me”. Interesting to note that work frustrations and not doing what you love is the #1 frustration for those not doing work they love. It just goes to show how important it is to do work you LOVE everyday. Love the results. I think it shows that a lot of your audience is fired up about the right things and if not as happy as they would like to be, at least working toward that goal. I think happiness, success and all the other things are a journey. It is a goal that you never get to the end of, you just get farther and farther along the path. There are always things to improve and ways to do better, and it is great to see that it seems like a lot of people in your audience are moving forward on that path, either making changes or having had changes for the better on their path’s. You’re definitely right. It’s all about the journey and the successes a long the way. There’s always new people visiting this site and I’d actually be curious to know what percentage of respondents completed last years survey as well. A direct comparison probably isn’t the best because the respondents will probably mostly be different… but it’s interesting to see the progression of the community in general. I just registered and am impressed by your work. Keep up the great job! Look forward for your next posts.